The title is from today’s post in one of my favorite blogs, allthingsfulfilling.com. Sue Batton Leonard is the writer. She really does write about anything and everything that brings joy and fulfillment: art, film, books, nature, travel, and above all people. She seeks out interesting folks and tells their stories. Right now, she’s about to publish a story of her own, a memoir about her family and her happy but challenged childhood in Baltimore. I’ve read the manuscript and it is a lovely story about how hardships like life-threatening health problems sometimes bring the most amazing surprises and blessings into the life of a family. 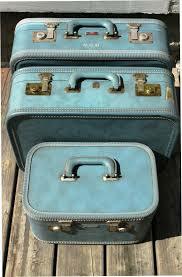 Today’s post begins with a photo of her family’s luggage in the 1950s, all ready for a road trip. The post describes her family’s history of taking off together on long road trips along the East Coast from their home in Baltimore. Sue’s parents believed in the value of travel. In the days before everyone had a smartphone or personal game device, road trips were especially long. When children started fighting in the back seat of the station wagon, Sue’s mother decreed that it was time to sing, and sing they did. Like Sue, I wish everyone happy and safe travels on this Thanksgiving holiday! This entry was posted in Uncategorized and tagged All Things Fulfilling, family road trips, Sue Batton Leonard, vintage luggage on November 27, 2013 by Claudia Suzan Carley. What a lovely idea to have a special matched set of luggage. Travel nowadays is not as elegant as it used to be, but it’s still wonderful most of the time!